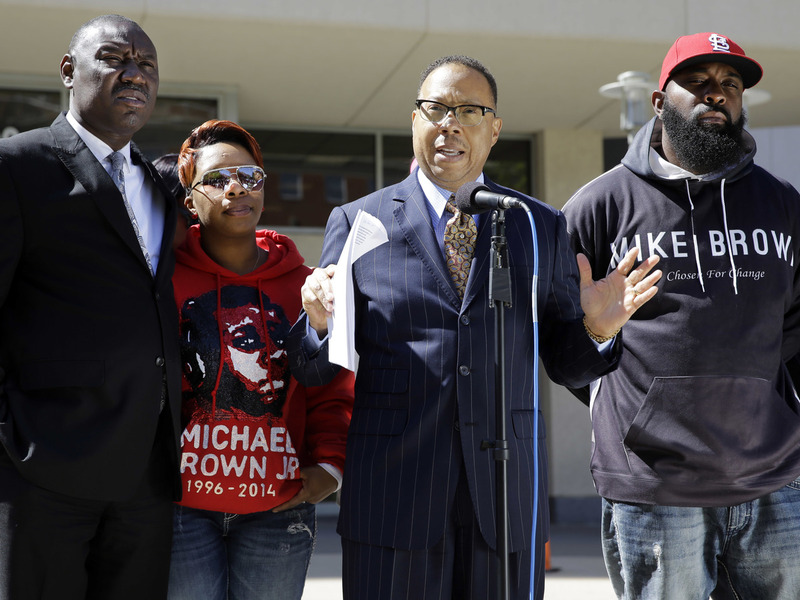 Michael Brown's Parents Settle Wrongful Death Lawsuit With Ferguson, Mo. : The Two-Way Brown's parents sued after their son, who was black, was shot and killed by a white police officer in August 2014. The shooting sparked nationwide protests. Attorney Anthony D. Gray speaks at a 2015 news conference as Michael Brown's parents, Lesley McSpadden, second from left, and Michael Brown Sr., right, listen along with attorney Benjamin L. Crump, left. The parents have settled a wrongful death lawsuit with the the city of Ferguson, Mo., over the fatal shooting of their son. The St. Louis Post-Dispatch reports that U.S. District Judge E. Richard Webber approved the settlement with Brown's parents, Michael Brown Sr. and Lesley McSpadden — and ordered it sealed. That means the terms of the agreement will not be made public. It's not clear whether the individuals named in the lawsuit are parties to the settlement. The paper says a person familiar with the settlement negotiations said the agreement would be for less than $3 million because that is the maximum the city can pay under its insurance. Webber wrote that the amount Brown's parents will receive is "fair and reasonable compensation for this wrongful death claim and is in the best interests of each Plaintiff," the Post-Dispatch says. But Webber said the details will remain secret because "disclosure of the terms of the settlement agreement could jeopardize the safety of individuals involved in this matter, whether as witnesses, parties, or investigators. The public policy to consider records open is outweighed by the adverse impact to Plaintiffs." As The New York Times reports, Wilson said he fired his gun because Brown had attacked him. But some witnesses said Brown had his hands up when Wilson fired. Wilson was not charged with any crime and left the Ferguson Police Department in late 2014. St. Louis Public Radio says while the U.S. Department of Justice found that Wilson did not violate Brown's rights, it did find that Ferguson's police department and municipal courts routinely violated African-Americans' civil rights. The city's police and courts now operate under a consent decree.